Pork Amandine, Thyme for Cooking gourmet menus. 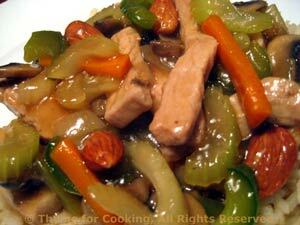 Pork lends itself so well to stir-fries but you could substitute chicken, turkey or even tofu if you prefer. If you buy a larger tenderloin, divide it and freeze half for another time. Or use boneless chops.